Onstage, Sevendust frontman Lajon Witherspoon is widely acknowledged as one of hard rock’s most gripping performers and electrifying voices. Offstage, he’s seldom heard, mellow as a church mouse, and as mild-mannered as they come. Less than a week into his band’s first tour in more than six months, Witherspoon gets notably agitated when asked about the prospects of hitting the road in support of two albums - their first studio effort since joining forces with new label Winedark Records, and the recently issued greatest hits album issued by their former label. Make no mistake, Sevendust have no intentions of breaking up. In fact, after the departure of guitarist Clint Lowery in December 2004, the four remaining members - Witherspoon, guitarist John Connolly, bassist Vince Hornsby and drummer Morgan Rose - didn’t miss a beat. While awaiting the deadline for then-label TVT Records to renew their option with the band (a deadline they missed, which freed the band to sign with Winedark) the quartet secured a bank loan and entered the studio on their own to begin writing the material that would become Next, their fifth studio effort overall. The results are Sevendust’s most visceral output since their self-titled debut in 1997. From Rose’s blast-beats and the piss-and-vinegar guitar spray of opening track “Hero,” to the Slipknot-flavored heavy metal onslaught that reverberates through “Pieces” and the pointed rage of “The Last Song,” into the soft, supple harmonies of “This Life” and beyond the final acoustic pangs of closing track “Shadows In Red,” Next is Sevendust’s crowning achievement. Because, for a while there, it was getting pretty easy to take things for granted. 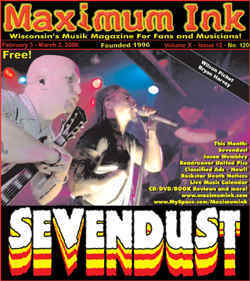 Sevendust are performing Feb. 10 at the Pearl Room in Mokena, IL, Feb. 11 at the Checkered Flag in Appleton, WI, and Feb. 12 at the Rave in Milwaukee. Supporting on all three shows are Nonpoint, Wicked Wisdom and Social Burn.